A new book by Leigh Gallagher heralds "the end of the suburbs," but it may just be a change in how people want to live and get around in suburban communities. Judging from new suburban developments happening in the DC area, that shift is already underway. 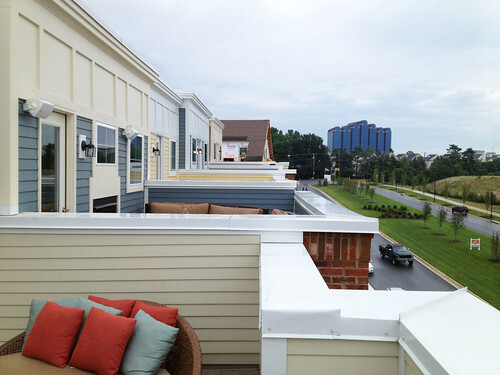 New townhomes with roofdecks at Crown in Gaithersburg. All photos by the author unless noted. In recent years, there's been a lot of research about how many people, whether young Millennials or retiring Baby Boomers, want to live in places where they don't have to drive everywhere. That's part of the reason why center cities, like DC, have experienced a resurgence in recent decades. But it leads some commentators to assume that everyone's going to move to the city now, and that's simply not true. Even if we raised the height limit, cities like DC can only hold so many new people. 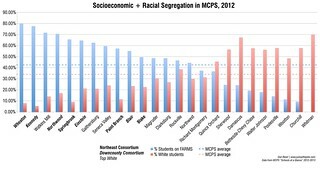 And the false binary between "city" and "suburb" ignores the actual diversity of places on either side of the city line, along with the possibility that people can have the urban, walkable experience they want in a "suburban" place, especially one where they may have grown up and feel connected to. 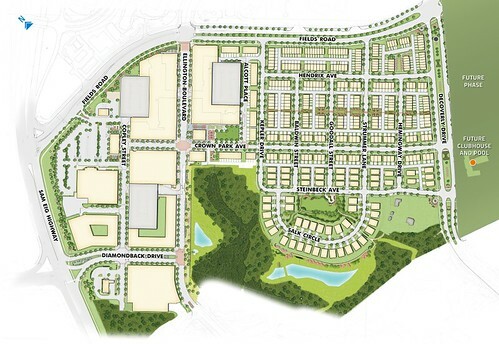 Site plan of Crown's first phase. (Note the cool street names: Strummer, Hendrix, etc.) Image from the developer. Take Crown, a New Urbanist development being built in Gaithersburg that I visited last weekend. It was originally an 180-acre farm dating to the early 1800's, but today it's surrounded by office parks, cul-de-sacs and the Washingtonian Center, an early lifestyle center that I call "Green Day urbanism" because it's a sort-of walkable, urban environment. Urban design firm Perkins Eastman/EE&K laid Crown out as a series of compact, walkable neighborhoods around the future Corridor Cities Transitway bus rapid transit line, which just got design funding from the state of Maryland. While construction is only beginning, it's clear that projects like Crown represent a very different approach to suburban development. The developer has purposely marketed Crown as an urban place, even naming its website SmartUrbanLiving.com. Most of the over 2,000 homes being built here will be townhouses or apartments. Instead of big backyards, the homes have roof decks, but there will be several public parks. The Corridor Cities Transitway will have a stop right here. This project's biggest amenity isn't privacy or quiet, but being close to "Downtown Crown," a 260,000-square foot complex of shops and restaurants surrounding a plaza, the Washingtonian Center, or all of the jobs at the Shady Grove Life Sciences Center. One of the first things you see upon entering is a sign saying "Future Right-of-Way of the Corridor City [sp] Transitway." 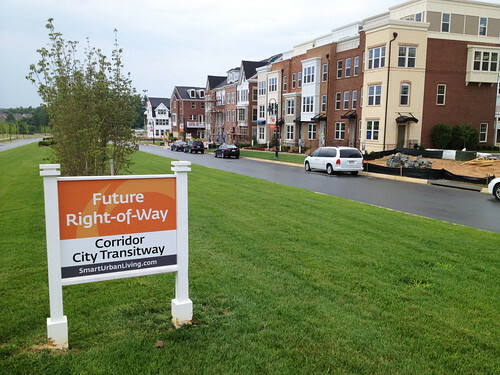 Unlike nearby King Farm in Rockville, whose residents have protested the CCT in a neighborhood built around it, Crown residents will buy homes there expecting transit to come. These amenities might explain why neighborhoods around Crown have some of Montgomery County's highest concentrations of young families. A generation ago, these buyers might have moved to Gaithersburg because it was cheap and they could buy a big house there, even if it was far from everything. Today, many young families are moving to neighborhoods in the District because they offer a sense of community, easy access to shopping and jobs, and don't require a car. But they're also choosing places like Gaithersburg that are willing to evolve and adjust to meet their needs. At Crown last weekend, I toured the model houses alongside many young couples with kids. Some of the townhouses here sell for over $700,000, which is certainly out of reach for many families. But it's also a testament to how desirable places like this are, even in a community 20 miles from downtown DC next to a transit line that hasn't even been built. Media, the kind of suburb Leigh Gallagher says people want more of. In an interview with the Washington Post's Jonathan O'Connell, Gallagher admits that many affluent car-oriented suburbs, particularly those with good public services like schools, will probably remain sought-after. 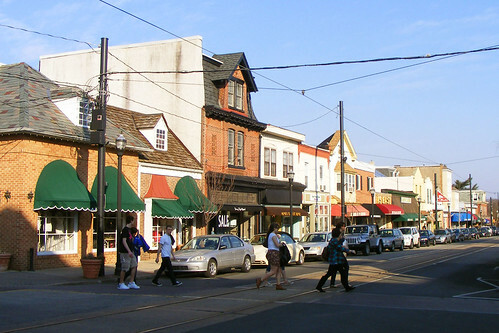 And she notes that people may be drawn to suburbs like Media, the historic, walkable, trolley-served town near Philadelphia where she grew up. There aren't a lot of Medias in the DC area, but there's no reason why we can't try to create more places like it. Crown is just one of several transit-oriented developments being built along the CCT in Gaithersburg. And from the Mosaic District in Fairfax County to Maple Lawn in Howard County, the DC area has become a national leader in showing how suburban communities will evolve in the coming decades. While "The End of Some Places with Suburban Land Use Characteristics and/or Bad Schools" isn't as catchy or provocative a title, it's more accurate description of what's actually happening. People will still be able to live in a big house on a cul-de-sac, if that's what they want. But we'll also see new kinds of suburbs for those who want something else. Anyone who follows "New Geography" will know that the so called "preference shift to core cities and density" is not remotely a "death of the suburbs" phenomenon. Firstly, it is a case of clever use of statistics. A 5% share increasing to a 6% share, is "a 20% increase". The same trickery is routinely used in transport mode share "analysis". The other 95% falling to 94% is hardly a "death". Secondly, most of the growth in "core city municipalities" is in the "suburbs" OF those municipalities, not in the dense city per se. Furthermore, a lot of this "growth" is the return of growth that was strangled by inflating prices during the bubble. Of course the most expensive areas became more unaffordable to more people than ever, and this tends to temporarily deflect growth towards the least unaffordable locations. After the crash, people making choices once again have a greater chance of affording the more central location compared to before. Your point about the character of suburbs and "cities" is spot on. It is perfectly possible to locate in a suburb in such a way that you can live a walkable, transit-dependent lifestyle if you want to. I have lived in suburbs all my life and have never even thought about amenities - we just bought the homes with the features we liked, but quite by accident, have always been within 10 minutes walk of a post office, library, supermarket, primary school, medical centre, police station, etc etc. And 5 minutes walk from a main transit route stop. Furthermore we have always been within 10 minutes drive of accountants, lawyers, engineering shops, cinemas, jewelers, delis, cafes, a concert venue, and practically all the specialist stuff we might want. We don't bother to go near the region's core city for anything, it is far too much hassle and congestion and parking difficulty. There are plenty of things the suburbs have that the cities don't. Like sports clubs for the young, for example. People who call the suburbs sterile just don't understand the difference between impersonal crowds and picking your associations on the basis of shared interests. 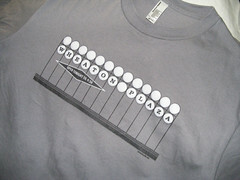 There are cities with "jewels on a string" suburbs that grew up close to a century ago and are still going strong: e.g., follow Metra out through Elmhurst, Villa Park, Lombard, Glen Ellyn, Wheaton, or NJ Transit through Cranford, Westfield, Scotch Plains and Plainfield. Each line (and there are lots more) have a series of vibrant walkable commercial districts surrounding transit. For perspective, the end of both these lines is about the same distance to their respective city centers as Gaithersburg is to DC. Hopefully we can get some beads on the red line string, instead of a dump (OK, transfer station) and some car dealers at the end, with a half-vacant semi-town center centered on a Safeway half mile away. Though I did notice finally some residential across 355 from King Farm. Crown looks OK, but nothing particularly radical. It's single-use, and has limited connectivity to the street grid around it. I don't necessarily want to argue that the site needs to align to a geometrically-perfect grid (although places like Columbia, MD are certainly a strong argument for that), but it does need better connectivity. The current site plan seems to eschew connectivity for "privacy." 6 entrances for 2,000 homes. That's laughable. It's a walled garden, just like so many of the other suburban developments in the DC area. Interesting post with all the discussion happening regarding M-83, the complement highway to Great Seneca Highway to the east side of I-270. With all the opposition to completing the highway to Clarksburg, and with prices of over $700K for Crown TH's, I hope that homeowners in MV and Gaithersburg will wake up and realize that their opposition to M-83 is costing them $300K-$400K. Good going folks - enjoy Lake Forest Mall! Guess they don't mind the west side of I-270 prospering - fine jobs, great housing investment, excellent shopping.